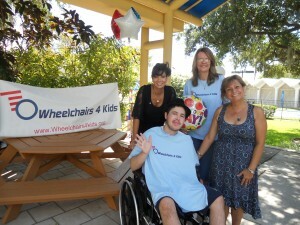 Well, this is Wheelchairs 4 Kids first blog. It is Sept. 11, 2011, the tenth anniversary of one of the most tragic days in American history. Today has been such an emotional rollercoaster. Waking up and remembering that day ten years ago like it was yesterday; watching the memorials get underway on television and honoring those who sacrificed everything for complete strangers in a few moments of silence. It was heart-wrenching to watch those horrific scenes once again, yet so inspiring to see how the American spirit prevailed by people reaching out and helping one another in their greatest hour of need. The best way that we could honor the memory of those brave heroes of 9/11 on this momentous anniversary was to reach out and help a young man who is prevailing over his own nemesis – cancer. Matt has a high grade glioma, a very aggressive brain tumor. Since November, when he was first diagnosed, Matt has endured radiation and chemotherapy. The tumor has affected his motor skills and stamina. Matt was using a borrowed wheelchair that was in disrepair and too small. Julie Wientraub, owner of The Gold and Diamond Source as well as president of her own nonprofit, Hands Across the Bay had told us about Matt’s situation. We immediately got in touch with Matt’s mom, Rita. She provided us with Matt’s measurements and we ordered a custom sized chair for him which arrived on Thursday. Matt and his mom were presented with tickets to the Disney on Ice show for today by one of his nurses at Tampa General Hospital. We knew that it would be very difficult for him to go to the show unless he had a new chair before arriving at the forum, so we called The Ronald McDonald House in Tampa and asked if we could use their facility to present the chair. Matt and his family had stayed there for two months when Matt was first diagnosed. Betsy Wilkinson from The Ronald McDonald House readily agreed. Winn Dixie of Tarpon Springs donated fresh baked cookies and drinks for the presentation. So this morning, volunteers from Wheelchairs 4 Kids, Terry from The Ronald McDonald House and Julie from Hands Across the Bay came together to present Matt with his new chair. It was a great moment to see Matt sit in his new chair for the first time and say, “it’s comfortable” with a big smile on his face. I think the most amazing thing for me was watching everyone working together for Matt. To be honest, it was overwhelming and at times I found myself getting a little emotional – in a good way – on September 11th. I was conflicted. My mind couldn’t get away from what today stands for. And wondering – is it alright to be happy? We had the volunteers from Wheelchairs 4 Kids, Terry from The Ronald McDonald House, and Julie from Hands Across the Bay all there to cheer Matt on in his battle against cancer. We were smiling, laughing, and sharing stories over cookies all the while the names of those lost in New York, the Pentagon and Shanksville, PA were being read in remembrance by their loved ones. But then it dawned on me that this really was the best way that we could pay tribute to them; three charities working together to make a difference. So many heroes died that day trying to help their fellow man. I think the best way to honor them or any loved ones is to perform a good deed in their name. We would like to dedicate today’s wheelchair presentation to Matt to all of the families who lost their heroes that day.